After the previous part’s thrilling climax, Moonfleet, Episode Two, heightens up the tension. With Block and Trenchard now accused of the murder of Mahoon they must go on the run. With Block preparing to go to France all seems lost until Trenchard realises the truth behind Blackbeard’s riddle and the two go in search of the pirate’s lost diamond. Episode Two of Moonfleet continues the rapid pace established in the first instalment and runs with it. The pace of the story and the threat of capture speed up the action in the first half of the story and this is aided by the stylish but quick camera movement. The sense of urgency draws us into the plot and therefore makes us want our heroes to succeed. The first half of the episode also carries forward the sense of jollity in the face of terror that was present in the previous episode. This is particularly prevalent during the scenes featuring Aneurin Barnard’s Trenchard and Ray Winstone’s Block. Both characters bounce off one another well. Thanks to the great acting and writing you get a sense that they both enjoy each other’s company and genuinely like one another. In other words, they get a sense of truthfulness which is only ever reached by the best of television and film. The second half of the episode is bleaker and feels like the series darkest hour when Trenchard and Block are taken off to prison after being captured by the militia. When they are put on a ship for the colonies it looks like things can’t get worse for our heroes. The ship looks genuinely vile and this is helped by the odd bucket of water thrown into the scene for good effect. The final resolution to Moonfleet is touchingly done and gives a strong sense of closure and completion. 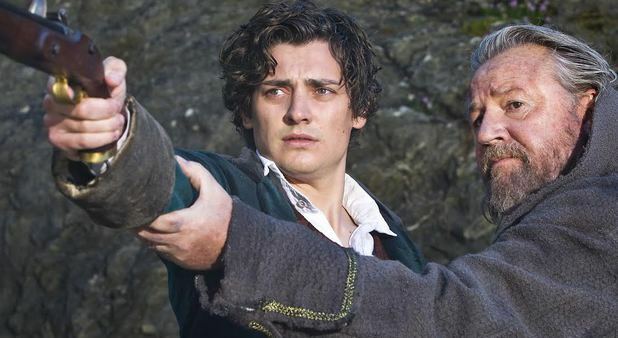 Overall, Moonfleet has been one of the best period dramas to grace our screens in recent years. With a feel of action and adventure carrying it along with a sprinkling of comedy when needed, Moonfleet is jolly good fun. If you didn’t manage to catch it on Sky One over the Christmas holidays I would strongly recommend purchasing the DVD release.